Comics have been collected by children for decades, but only began to be taken seriously as a collecting area in the Sixties, when the first conventions were organised. The area became established by the Seventies and has developed since and collectors now include millionaires! The most expensive comic ever sold fetched a staggering £1.4 million. Said to be the first 'modern' comic book, it was 'Action Comics' No 1. Another copy of this comic was recently found in a wall! The first issue of a title is often the most desirable and valuable, with values dropping considerably for subsequent issues. Most comics had large print runs. Other sought-after issues include those that feature the first appearance or death of a character or a major event in their story arc. Historical topicality, such as the first nuclear explosion or wartime propaganda, can also increase desirability. Values also rise if a successful film, or TV series is released and this revives interest in a character. A good example is Spider-Man, the subject of four recent films. Condition is vitally important, so look out for bright colours, no tears, scuffs, browning or written annotations. Be aware that although some superhero comics, such as those by Marvel, are collected internationally, others may have appeal in one country only. Issues of 'The Beano Comic' from before 1948 are much harder to find than later editions. During the war, paper supplies were strictly rationed. Children were encouraged to share their comics with family and friends and to hand them in for other uses after they were fnished, rather than collect them. As a result, the few examples that survive are usually in poor condition as they have been read many times. 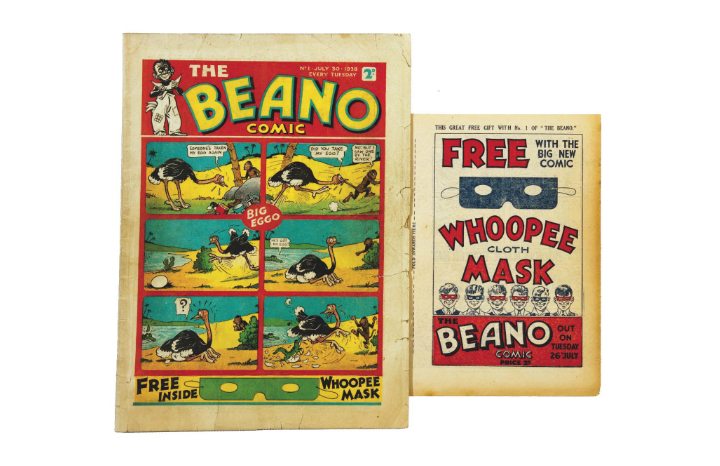 'The Beano Comic' No 1 pictured above from July 1938 is in very good condition and valued at £5,000-£7,000. And Bob's your uncle! What's behind the funniest phrases in the English language?